Critics, including the President himself, have been quick to point out that the NFL's ratings are down. But what they won't tell you is that the NFL is down significantly less than the rest of broadcast television. Through week seven, the NFL is down 5% overall from the same point last year. That's a troubling drop for the biggest ratings powerhouse on TV, but it seems less dire when you consider that the four major networks are down an average 8% in prime time. NBC is down 4%, CBS is down 6%, ABC is down 11%, and Fox's prime time viewership dropped 20% through the first month of the new TV season, according to Nielsen data. And those numbers are down despite the inclusion of live sporting events, which usually bring in big audiences. The NFL's sluggish viewership may be less a symptom of the league's problems and more about what's happening in the TV environment overall. The landscape has become incredibly fragmented, thanks to a flood of programming and competition from streaming services and from the internet, not to mention a 24-hour news cycle that comes with a breathtaking amount of content. Television, Netflix, Hulu and Amazon are all vying for the same eyeballs, and there are no signs that the deluge of programming will ebb any time soon. The numbers for network TV are also partially tied to the NFL's struggles, since CBS and NBC both broadcast games in prime time on Sunday and on Thursday nights. "Regardless of the declines, the NFL is still by far the highest rated sport on TV and often the most watched broadcast on TV," said Brian Hughes, a senior vice president at Magna, which monitors audience trends. "Last year when the ratings were down, it seemed like a shock. This year looks to be a part of a trend rather than a big disruption." The league's viewership took a hit last year, which means that not even the mighty NFL is immune to the changing world of TV. Some observers blamed the drop last season on a number of issues, one of which was a contentious presidential election. 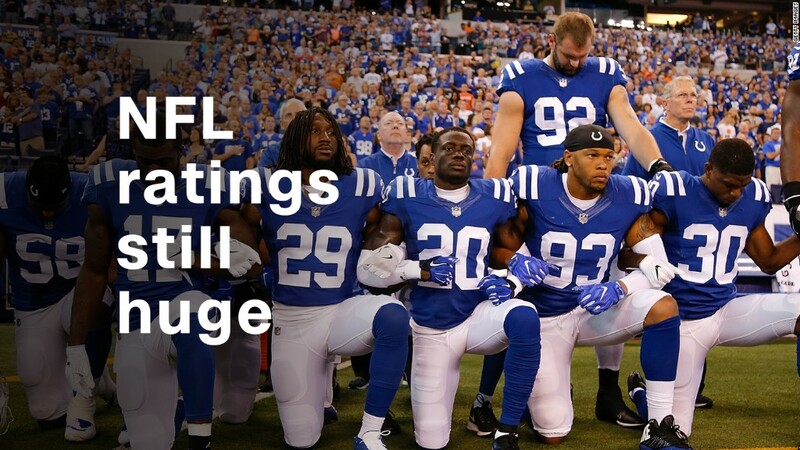 This year, the league's declines have been a focal point for President Trump, who has attacked the NFL over players who kneel during the national anthem to protest police violence. Executives and observers will continue to watch the NFL's ratings and try to figure out what's causing the falling viewership for the biggest show on TV. Critics have cited everything from lack of star power at the quarterback position to lopsided games as reasons for the down numbers. 21st Century Fox CEO James Murdoch offered another reason: over-saturation. "You're asking a lot from customers to watch Thursday," Murdoch said at the Paley International Council Summit in New York on Wednesday. "They watch a lot more college football game on Saturdays, and then on Sundays, and then on Monday Night Football, etc. It's a lot. So I do think that preserving the scarcity value of those events and that audience is something that is worth thinking about." But as the falling broadcast numbers show, problems around TV ratings may be bigger than just the NFL.